Over the years the types of dissection classes available have focussed on two main types of cadavers that are being worked on, embalmed and unembalmed. I am often asked the difference and for my preference and I have previously had to say that I was firmly on the fence in terms of preference as both models are incredibly instructive and have their own particular bonuses. As will be explained, I have changed that position. In dissection rooms and anatomical classes using cadavers, the specimens are mostly embalmed. In this process a solution of chemicals is circulated through the body to prevent decay. This then ‘fixes’ the body so that the bacteria present in the body that would otherwise rapidly break down the tissue, is killed. It effectively sterilises the form and means that it can be studied at leisure and kept for a long period of time without any deterioration in the condition of the tissues. Medical schools are allowed to retain donated bodies for up to three years under the Human Tissue Act. There are some drawbacks to this process. The traditional approaches, where significant amounts formaldehyde is a part of the process, tends to leave the body quite stiff and the tissues firm. The joints tend to lack much movement and the skin and muscles are in some instances pretty solid! It can be overdone and those medical schools who need to keep their specimens for extended periods, will produce an embalmed cadaver that is saturated with chemicals to ensure longevity. The result can often be a leathery cadaver that bears little similarity to the human body we touch every day. However in a twist to this variation, I will be running classes in Nottingham and Oxford using a brand new approach to embalming, where the techniques used give a ‘fix’ which keeps the cadaver mobile and pliable. This is quite honestly way better than any fresh tissue dissection you can imagine and has been recently dubbed The Surgical Soft Embalming technique. All my classes from 2017 will be using the soft embalmed technique, with only the occasional exception. There have always been concerns regarding the safety of formaldehyde and formalin as it’s safe to say that these are both pretty nasty chemicals. Even with the stronger solutions used in traditional techniques, the amount of harmful chemicals that remain after the process is finished is very small. Air quality is always monitored and there are no health concerns to student or delegate exposure. With the new SSE technique, the amounts of formaldehyde are incredibly small with concentrates as low as 0.6% at the point they are introduced to the cadaver. By the time they are distributed around the body, the amounts are virtually untraceable by standard air monitoring equipment. 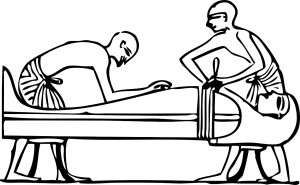 Other dissection classes still hold to the belief that fresh is best, although I can confidently say that anyone suggesting this, has not seen the results of the Surgical Soft Embalming process. Fresh is difficult to work with at best, and pretty unpleasant at worst. By the end of a five day dissection class, we are seeing a cadaver in a fairly advanced state of deterioration and the odours and fluid associated with this can be challenging to say the least. The benefits of the fresh cadaver are obvious. Soft tissues, mobile joints, soft, almost liquid skin tone and a bright tone of colour to the muscles. The viscera and blood organs are soft and pliable and the tissues have a ‘lifelike’ feel. All of this applies with the Surgical Soft Embalm, to the point that those who don’t know, would swear that the SSE cadaver was a fresh specimen. There are some surgeons who will still insist on fresh tissue to practice on, but those who have seen and felt the new process are instantly converted. Whilst there will be some who will stick to the tradition of fresh is best, this is no longer a viable option as far as I can see and I will not, unless it is absolutely unavoidable, be working with fresh/unembalmed material again.